Located adjacent to Puerto Qutzal, the marina offers both fixed and floating docks complete with all modern amenities. There is a restaurant on-site that can provide cold drinks and a comfortable atmosphere to watch the boats coming in after a hard days fishing….. Your typical fishing day starts with a pickup from accommodation at 6.30am and a transfer to the marina. The boats are prepared and waiting for you on arrival – planning to leave the dock at 7am. From there, we make our declaration to the port authority of the crew and passengers on board and our approximated initial destination. From there it is a comfortable run out to the fishing grounds. Initial fishing reports start coming in from other Captains in the area so that we have the best current information on hand for where the blue water starts and the bait is concentrating. This communication throughout the fleet continues over the course of that day as more definite reports are acquired. All billfishing in Guatemala is catch and release, so there is no motivation to keep information quiet…………..unless of course we have come across schools of dorado or tuna – in which case we have our pickings first ! The boats pull in lines usually around 3pm – depending on distance from the marina at that point – planning to be back at the dock between 4-4.30pm. A lot of people ask this question and our reply is safe. Like any destination, you have to be conscious that you are a tourist, be aware of your surroundings and use reasonable judgement at all times. As long as you are part of an organized tour and heed advice, you should not encounter any problems. Over the last 10 years we have not heard of any incidents involving anglers. How Have the Hurricanes Affected your Operations? We had a few of our private houses that had to be repainted but are now in excellent condition. All infrastructure at the coast is now operating normally. Where is Puerto San Jose, Guatemala? Puerto San Jose is on the Southwest Pacific side of Guatemala. After landing at the Guatemala City International Airport it is around a 90 minute drive to the coast on one of Central Americas newest 4 lane highways. Where is the Villas del Pacifico Resort? Why is Fishing so Good? There is a natural circulating current along side Guatemala’s Pacific Coast between Mexico and El Salvador that creates a natural eddy that is rich in bait. Blue water can be found from 2-50 miles offshore all year. What is the High Season? Fishing is good year round but the high season is November thru May – primarily because this is when the weather is most temperate, seas are calm – and many folks like to leave the colder climates to enjoy some sunshine! Why is Guatemala More Expensive than Mexico or Costa Rica? Most of our packages are all inclusive (except for airfare). That means you arrive at the airport in Guatemala City, you are picked up by us or our driver who will take you to the Villas Del Pacifico ~ staying here means your food and drinks (local) are included. We will pick you up every morning and take you to the marina, and you will be met at the end of the fishing day and escorted back to the resort. At the end of your trip we will take you to Guatemala City/La Antigua for your last night or the airport. Baja and Costa Rica tend to fish a narrow range clos(er) inshore – whereas the Guatemala fleet pursue the large schools of pelagics frequently up to 50 miles offshore – so the difference in fuel consumption is significant. Airfare, tips to the crew and house staff, optional excursions, some fly-fishing tackle/flies/leaders/tippets and any item of a personal nature. What Type of Fish are there? The majority of people come for Pacific Sailfish. We do have dolphin (Dorado), yellow-fin tuna, blue/black/stripped marlin and Wahoo. 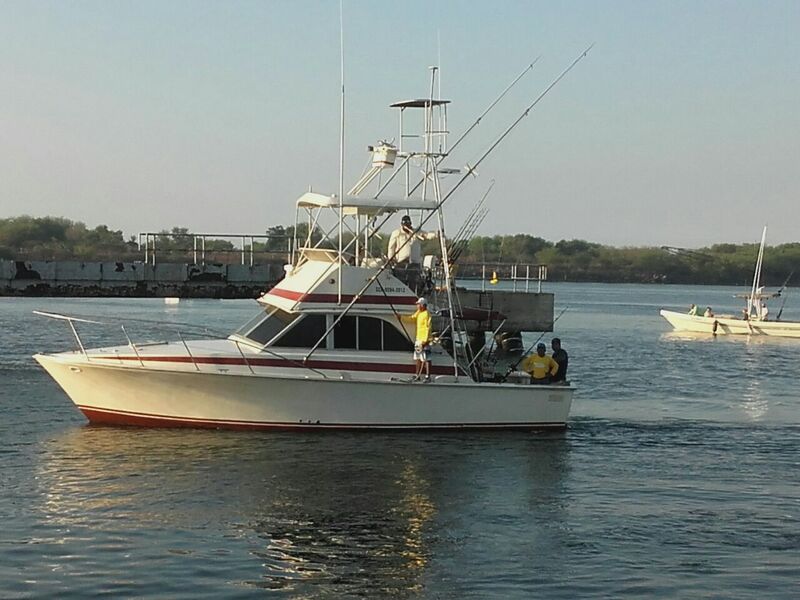 There is also inshore fishing for rooster-fish, jack, sierra, Spanish mackerel, and cubera snapper. How Far Away is Guatemala? Guatemala is a 2.5 hour flight from Houston, 3 hour flight from Atlanta & Dallas, 2 hour flight from Miami, and a 4.5 hour flight from LA. Guatemala’s pacific coast is hot with the rainy season starting in late May and goes thru October. The dry season starts in late October and goes though mid-May. Bring you passport, shorts, sun block, sunglasses, deck shoes, insect repellant and a camera. Do I need to bring my own fly-fishing gear? Do you Carry Light Spinning Rigs? Yes, The Great Sailfishing Company offers light spinning rigs with Penn 460, 4600L, 4500ss and 6500ss reels.